Use with (6) Medium, Type A, E-26 - E-27 bulb(s) - 60 watt max. Bulbs sold separately. 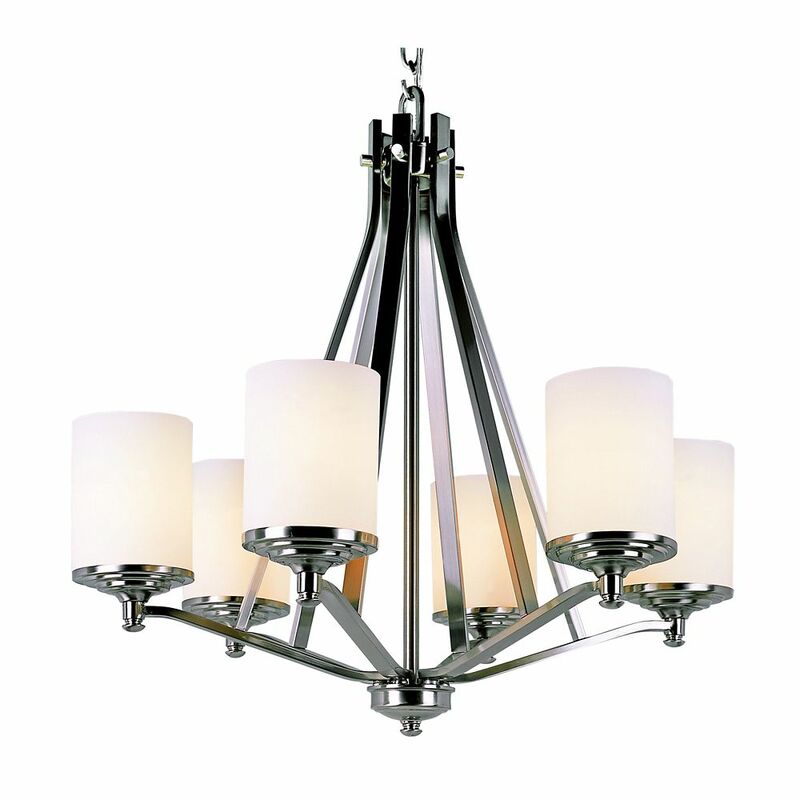 Alexis 6 light chandlier with hand blown opal glass shades are held in place by metal strapping and perched upon simple, upswept arms. This light fits most design styles and includes other lights in the family. In a polished nickel finish. Rejuvenate Your Space With The Genevieve Collection Of Lighting. Graceful, Flowing Arms Create An Aura Of Tranquility with perfectly decorated K9 crystal drops and beads. Peaceful And Elegant. The Contemporary Beauty Collection is well known for quality, style and value; this contemporary chandelier is no exception. Expertly pairing a charming satin nickel finish and easy to find incandescent bulbs, this fixture is both functional and picturesque. This well-rounded chandelier is sure to satisfy your indoor lighting needs. Nickel with Frosted Cylinder 6 Light Chandelier Cylinder white frost glass set on nickel sconce arms. Includes 6 feet of chain for height adjustments. Fixture attaches to matching decorative ceiling plate and is suitable for vaulted ceilings.